Is Mama dead let me know at once. | Scuffalong: Genealogy. Is Mama dead let me know at once. – Scuffalong: Genealogy. Is Mama dead let me know at once. Mama got sick after we come back from Greensboro. She got sick. At least, Mama, we never could tell when she was sick. ‘Cause she put on so much. If she wanted to go somewhere – go to New York, Norfolk, anywhere she could get, pack that bag, honey, and she’s gone. And leave us home! Leave us there. She took me to New York with her, and she carried Mamie to Norfolk, carried me to Norfolk one time, then she carried Mamie there. Oh, she was just always wanting to go. And Papa didn’t have enough sense, but just wherever she said she was going, she was going, and he give her the money and she’d go. But Mama didn’t know she had a bad heart until two weeks before she died. She was always sick, sick all the time. She’d go to the doctor, and the doctor would tell her it was indigestion and for her not to eat no pork and different things she couldn’t eat. ‘Cause Mama was fat. She weighed 200. She wasn’t too short. She was just broad. Well, she was five-feet-four, I think. Something like that. And so, but she loved pork, and she’d try to eat some anyhow ‘cause we always had a hog, growing up. All the time. So after they said she couldn’t, she tried not to eat no pork, much. Fish and chicken, we eat it all the time. But she was so tired of chicken until she didn’t know what to do. And I was, too. But Papa loved all pork, so he’d always get a whole half a shoulder or a ham or something and cook it, and she’d eat some. But when she went to the doctor, and her pressure was up so high, and he told her, “By all means, don’t you eat no pork. It’s dangerous to eat pork when your pressure is too high.” And then that’s when she stopped eating pork. Well, it didn’t help none, I don’t reckon. After that, when she was going to Mamie’s, she had that little bag. A little basket. A little, old basket ‘bout that tall with a handle on it. She had all kinds of medicine in there to take. And Mr. Silver told her, said, “Well, you just take your medicine bag.” She’d been married to him a good while. He said, “Well, you shouldn’t go up there by yourself. Since I’m down here—” See, she’d go up and stay with him a little while, and then he’d come back to Wilson and stay a while. So he said, “You just take your little basket there with your medicine in it.” So, he said, “Well, I’ll go with you up there and then I’ll come back on to Enfield.” So he went with her down there to the station. He was picking up the bags to go up there, told her to walk on up to the station and wait for the train. So, she went up there to the station and got on there, and went on and got on the train, and when she got off the train, in Selma — ‘cause she’d done told me to send her insurance and everything to Greensboro, ‘cause she wont never coming back to Wilson no more. Because she’d done seen, the Lord showed her if she stayed in Wilson, she wouldn’t live. If she went ‘way from there, she could get well. So she was going to Mamie’s. And when she got off the train and went there – she’d just got to the station door. And she collapsed right there. And by happen they had a wheelchair, a luggage thing or something. The guy out there, he got to her, and he called the coroner or somebody, but he was some time getting there. But anyway, they picked her up and sat her in the wheelchair. They didn’t want her to be out ‘cause everybody was out looking and carrying on, so they just pushed her ‘round there to the baggage room. And so when the coroner got there, he said, “This woman’s dead.” So they called Albert Gay, and he was working for Artis then. Undertaker Artis. And Jimbo Barnes. And called them and told them that she was dead. So, Mr. Silver couldn’t even tell them who to notify. 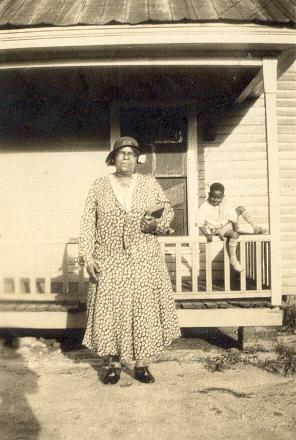 He had Mamie living in Thelma, North Carolina, on McCullough Street, but didn’t know what the number of the house was. So he was so upset. So they had to call the police for the police to go find Mamie Holt. On McCullough Street. And her mother, they said, her mother died. Well, she did die. But they said it was, I think, Thelma. Not Selma, but Thelma. “Well, where is Thelma? It can’t be my mother. ‘Cause my mother don’t live in no Thelma. I never heard of that place. She live in Wilson.” But, see, it was Selma where she died. They got it wrong. So then Mamie went down to Smitty’s house and had Miss Smitty send a telegram to me. On the phone. Charge it to her bill, and she’d pay her: “IS MAMA DEAD LET ME KNOW AT ONCE” She asked me if Mama was dead. And I said, when I got that, Annie Miriam and all them, a bunch of kids was out there on the porch, and so at that time, Jimbo or one of ‘em come up. And when I saw them, I knowed something. I had just got the telegram. Hadn’t even really got time to read it. Had just read it. And he said, “Well, you done got the news.” And I said, “The news? Well, I got a old, crazy telegram here from my sister, asking me is Mama dead, let her know at once.” He said, “Yeah, we just, we brought her back from Selma.” I said, “What in the – ” Well, I went to crying. And I don’t know. Albert Gay or some of the children was ‘round there, and they was running. Everybody in the whole street almost was out in the yard – the children got the news and gone! That Mama had dropped dead in Selma. So I said, well, by getting that telegram, I said, that’s what threw me, honey. I wasn’t ready for that. I’d been saying I reckon Mamie’ll think Mama was a ghost when she come walking in there tonight. Not knowing she was dead right at the same time. Remembering Sarah Henderson Jacobs Silver on the 76th anniversary of her death. Interview of Hattie Henderson Ricks by Lisa Y. Henderson; all rights reserved. Photo in the collection of Lisa Y. Henderson. → Senator Nicholson, Christian gentleman. ← Murdock v. Deal, 208 N.C. 754, 182 S.E. 466 (1935). Thanks! I’ve got a gold mine of transcripts of interviews from both my grandmothers! Thanks, Nia. My grandmother was a fine storyteller indeed. I grew up in the same town she did, so I had the extra boost of know the locations she spoke of, if not all the people. I like how you told the story in her voice. I wonder what drove her to travel so much. She was certainly was independent. What a blessing that you have the interviews. All the confusion surrounding her passing. You did a great job. Thank you for sharing her story. To some extent, opportunity, I think. At home in Wilson, Mama Sarah took in washing and ironing and occasionally worked in a tobacco factory. In Norfolk, she worked short stints at a cousin’s cafe and, in New York, she lived with relatives while working as a day maid. She’d make some money, quit, and go back to North Carolina. I also get the impression that she was not happily married (at least, to her first husband) and may have taken extended breaks from home for that reason. Oh my goodness!! This was so so awesome!! I loved this story so much! Thanks, Teresa. It chokes me up every time. Love this, the way you told the story and the story itself…wow getting a telegram like that? Great post! What an interesting story..reminds me of what I heard about my great-grandmother Louise “Mickey” Garnett she suffered from Hypertension and had a bad heart relatives said. She was visiting with her daughters in Houston, Texas when she collapsed and died from a Heart Attack. She apparently used to make her own blood pressure medicine from vinegar and various herbs. Aww, thanks, Renee! Love you, too, cuz! Pingback: I guess this is what I was going to hear. | Scuffalong: Genealogy.